The Easter basket is, I think, my first custom flash prop created with my new Flash Animation software, Koolmoves. The first public appearance of my new Superhero, GoAnimate Custom Character, Bat Storm (who cost me a coupon and 90 GoBucks to make). At around the time of the release of this video I surpassed 1000 fans on GoAnimate - making me the fourth person on the entire site to do so. 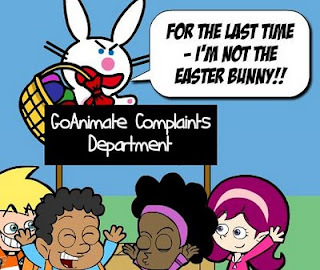 I must admit I don't always look forward to starting GoAnimate Complaints Department episodes but once I get started, with my first few jokes done, it becomes a lot of fun. They look easy to make, as evidenced by the number of people who've tried to do their own versions, but it actually takes a bit more effort to make it work without Happy Bunny coming off as sounding just plain mean.